Before a viewer dents to any film by Lordan Zafranovic made in his early years, especially before his academic days and professional career, there are a few things to think about. It has been more than fifty years since Zafranovic has made his first cinematic steps in his hometown, Split. A lot of things have happened since then, both in Zafranovic’s career and the context he was filming in. During the socialist era in Yugoslavia, he was well-respected and praised, especially for his film Occupation in 26 Pictures (1978). New times and his persistence in sticking to own beliefs have brought him some kind of exile. He lives and works abroad for decades, mostly in the Czech Republic. Seeing his earlier films, even those from the period of his amateur days, imposes the question what has Yugoslavian cinema lost by turning back to Zafranovic, but provokes many other thoughts as well. In the context of the Split film school, Zafranovic was the only filmmaker of his generation with a strong predisposition for narration. This is quite unusual for an author who belongs to a group of filmmakers who insist on something that would resemble the pure cinema, unburdened by the narration and completely relied on cinematic means. Zafranovic’s 1965 short Concert is a good example for studying his early filmmaking tendencies, as it shows his talent for narration and a good sense of using the cinematic weapons, as well as the elements of his style “inherited” from the Cine Club Split. The camera follows four people, musicians, on their walk through the city, seemingly in real time. They go through photogenic city squares and streets and end up at the beach. Filming protagonists from the back is one of the common stylistic tools in the Split film school which points out protagonists as the only important elements of the frame at some points and blends them with the city at some other points, making them equalized with everything else in the frame. Such treatment may be the key factor of this film’s persuasive atmosphere. 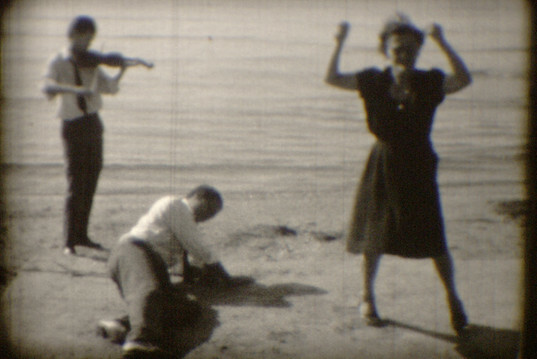 This film also shows Zafranovic’s experimental spirit, especially as the story approaches its end and Zafranovic’s sensitivity to sound elements rises. One of the protagonists conducts in front of the sea, and the sea “plays music”. Diana Nenadic describes this film as one of Zafranovic’s first dedications to “inebriation” as a general state of the spirit. Considering that the protagonists are artists, we can easily relate their inebriation with their inspiration. The depicted path, the walk that led them to the beach, may be seen as a quest for their inspiration. When the music begins, if we stay on the surface, it seems that the conductor is making art out of nothing. However, the conductor addresses the sea, which may reflect his own deep thoughts and emotions. He calls out for his own deepest inspiration. The sea doesn’t make music – he does, and he does it from his own inebriation. The viewpoint above may be persuasive to some, while some may refuse it. However, that’s not even so important, just like it is not so important when it comes to other Zafranovic’s early works. Far more important for the viewers is to think about what could an experimentative, sensitive spirit like Zafranovic bring to the Yugoslav cinema if things went in a different direction.